Lateral epicondylitis, otherwise known as tennis elbow, is a common condition which causes forearm pain for many Canadians. Tennis players, including amateurs and professional players are at much higher risk of developing tennis elbow1. Tennis elbow is a condition which is caused by repetitive strain and overuse of the extensor muscles of the elbow in the vast majority of cases. The research which has been performed on tennis elbow has indicated that it is not actually an inflammatory condition, despite being called an “-itis”. Researchers have determined that tennis elbow is actually a degenerative condition which is characterized by poor blood flow and degenerative changes to the common extensor tendon of the elbow2. The main symptom of tennis elbow is pain in the lateral side (outside) of the affected elbow and forearm. This pain may set in slowly over time with repeated low-grade injury to the common extensor tendon through repetitive injury. The pain may also begin rapidly after a bout of intense use of the extensor muscles of the forearm which you are accustomed to, during a raquet sport for example. 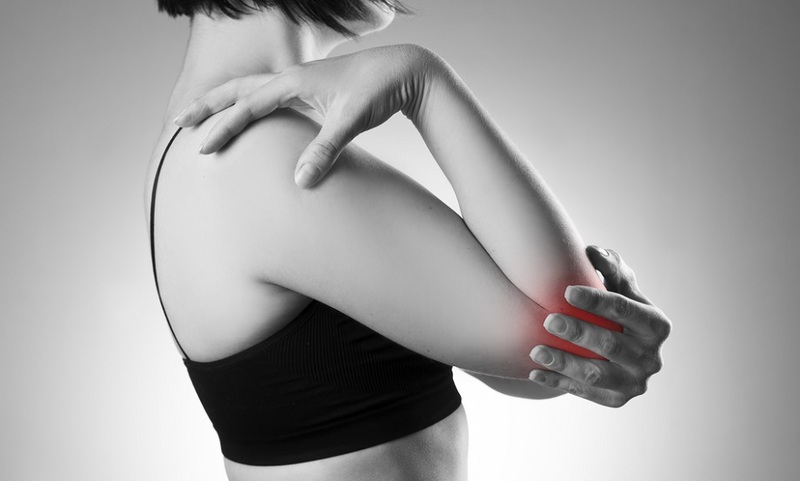 Tennis elbow is diagnosed through physical exam and by taking a health history. Imaging of the common extensor tendon may be performed in some cases with an MRI if rupture is expected or other causes of pain are suspected. Treatment of lateral epicondylitis typically begins with rest, bracing and oral anti-inflammatories for pain management. Specific strengthening exercises are an important step for strengthening and supporting the affected muscles of the forearm. If symptoms still persist after conservative treatment a cortisone injection at the site of pain may be given or even surgery may be performed on the common extensor tendon. Although cortisone injections and surgery can relieve pain associated with tennis elbow there are possible adverse effects and risks of further injury associated with both of these treatments. A platelet-rich plasma (PRP) injection involves collecting a sample of a person’s blood and using the platelet-rich portion of this blood to treat their pain. The concentrated solution of PRP collected from this blood is injected at the site of injury and stimulates tissue repair and healing through its high concentration of growth factors which are naturally present in platelets. PRP promotes repair and can give lasting relief in many painful conditions, including tennis elbow. The safety of PRP treatment is excellent as it uses simply a component of a person’s own blood. A large body of research has indicated that PRP injections are an excellent treatment for tennis elbow. The research has shown that PRP injections are more effective and have better safety that corticosteroid injections. For a more detailed look at this topic see this review article on the topic of PRP for tennis elbow. Pluim BM, Staal JB, Windler GE, Jayanthi N. Tennis injuries: occurrence, aetiology, and prevention. Br J Sports Med. 2006;40(5):415-423. Kahlenberg CA, Knesek M, Terry MA. New Developments in the Use of Biologics and Other Modalities in the Management of Lateral Epicondylitis. Biomed Res Int. 2015;2015:439309.